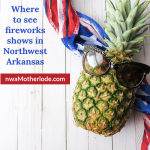 It’s time to kick off the season of holiday of FUN in Northwest Arkansas! We’ve got the big list of things to do with your family in November and December right here. Click on the name of any event below, highlighted in red, for more information. ***CLICK HERE to see a printer-friendly version of this list so you can put it on your refrigerator for future reference! Or snap a pic of the front and back to save on your phone. BOOKMARK THIS POST because we’ll be updating the holiday events frequently. 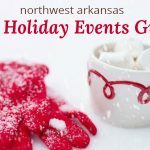 The NWA Holiday Events Guide printable is sponsored by the Northwest Arkansas Mall where Santa will be arriving on Nov. 17th! Pet Nights with Santa are Dec. 5 & 12 from 6-8 p.m., so bring your fur babies to pose with St. Nick! Nov. 12: Christmas Open House, Rick’s Bakery. Noon to 4 p.m. Door prizes, decorate a Christmas cookie, holiday samples, gift ideas. Nov. 7-12: White Christmas, Walton Arts Center. The timeless movie “White Christmas” is adapted for the stage in a lavish new production that The New York Times says to “put on your wish list.” Irving Berlin’s White Christmas tells the story of a song-and-dance team putting on a show in a magical Vermont inn and falling for a stunning sister act in the process. Full of dancing, laughter and some of the greatest songs ever written. 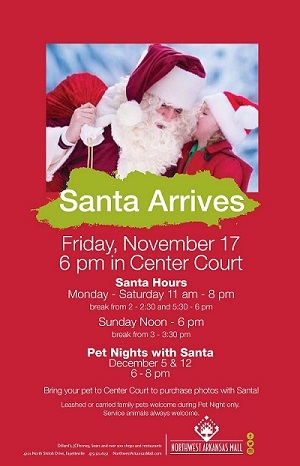 Nov. 17: Santa arrives in center court at the NWA Mall. See Santa’s hours above or in the graphic on the right! Nov. 17: Lighting of the Fayetteville Square and parade. 6 p.m. The lights illuminate the square each evening from 5 p.m. to 1 a.m. You can also enjoy nightly carriage and pony rides, fresh hot chocolate and festive holiday music. The lights will remain up through January 1st, 2018. Nov. 17. Simkins’ Brothers Sweets Holiday Bash on the Square. 6:30-8:30 p.m. Right after the lighting of the Fayetteville Square, stop by for free pictures with Santa, food and drinks, and holiday activities for all ages. Featured event will be the costume contest at 8:15. Wear your best Christmas attire for a chance to win. Come to the Pryor Center on the East Side of the Square for this free event. 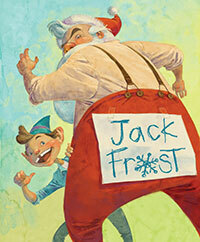 Nov. 18: Arkansas Arts Center presents Jack Frost at the Fayetteville Public Library. 10:30 a.m. The Arkansas Arts Center will bring its production of “Jack Frost” to FPL, 10:30 a.m. The North Pole has never known a more mischievous elf than Jack Frost, and this year his antics are more rascally than ever. In fact, he’s the number one elf on Santa’s list – and not his good list. Santa is so distracted by Jack’s bad behavior that he can’t even do his work. It’s a good thing that wise old Mrs. Claus is around to take her two high-spirited boys in hand and save the day – Christmas Day, that is. Starts Nov. 19: Stewart Family Christmas Light Display.The display will kick off at 6 p.m. with fireworks first. The family’s collection of lights started in 2003 with 3000 lights and 2 inflatables. Over the years it has grown to over 375 ,000 lights and over 250 inflatables. There’s a walk-through pathway so you can enjoy the lights and the inflatables. Parking is available on the corner in the field ( weather permitting ). Your children can drop off a letter to Santa through December 20th. There’s a train for your family to ride, $1 per person. Located at 4423 E Wyman Rd Fayetteville, 72701. The display runs through Jan. 3. Nov. 19: Annual “Meet the Artists” Holiday Showcase at Terra Studios. 1-4 p.m. in the Gallery. There will be snacks & cider, live music by local musician Dominic B Roy, live art demonstrations, and a chance to meet some of the artists whose work can be found in the Gallery at Terra Studios. The Art Lab will be open for drop-in arts & crafts for all ages with an emphasis on handmade holiday gifts. This event is free and is a great opportunity for some holiday shopping and fun. Nov. 24-25: The Little Craft Show Fayetteville, Fayetteville Town Center. Shop small for the holidays at the Small Business Saturday edition of The Little Craft Show. Over 100 makers and artists, food and drink. Friday night — 5-8 p.m. — will be an early sneak peek at vendors + freebies and cost is $15 or stop by Saturday for the free all-day event. 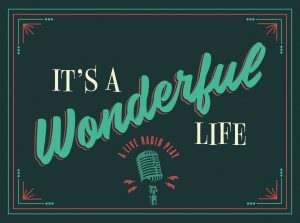 Nov. 29-Dec. 31: It’s a Wonderful Life: A Live Radio Play, TheatreSquared. Times vary. This inventive, live, twist on Frank Capra’s classic film brings the story of redemption and holiday magic to life on stage before your eyes and ears—as a radio broadcast, with live sound effects and high-energy performances. Holiday Eve Celebration Performances: Sunday, Dec. 24 and Dec. 31 will include complimentary hot chocolate and cookies for the audience before the show. Pure Joy Matinees: Following a tradition of ice cream at the theatre that dates back more than a 100 years, T2 will partner with Pure Joy Ice Cream to have custom, local handcrafted ice cream flavors at every Saturday and Sunday matinee in December for It’s a Wonderful Life. Nov. 30: Oh, Local Night. 5-9 p.m. Block Street businesses are opening their doors for an evening of sipping and shopping and celebrating all things local. Celebrate holiday open houses with libations, snacks and sales. Plus get 10% off at participating stores. Dec. 2: Jingle Bell Jog 5K and Reindeer Fun Run, the Botanical Garden of the Ozarks. 5K begins at 9 am; Fun Run begins at 10. Runners and walkers of all levels are invited to participate. The Jingle Bell Jog & Reindeer Fun Run is a great way to support the Botanical Garden of the Ozarks’ mission to provide education, entertainment and recreation for the thousands of visitors and students who come to the garden each year. Get into the holiday spirit and wear your Santa hats, elf ears — anything that sparkles and jingles. Dec. 2: Rudolph the Red-Nosed Reindeer: The Musical, Walton Arts Center. 10 a.m., 1 p.m. and 4 p.m. 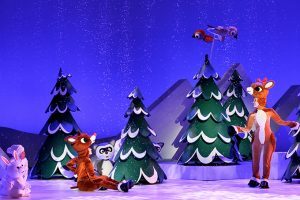 The beloved TV classic Rudolph The Red-Nosed Reindeer soars off the screen and onto the stage this holiday season. Come see all of your favorite characters including Santa and Mrs. Claus, Hermey the Elf, the Abominable Snow Monster, Clarice, Yukon Cornelius and, of course, Rudolph, as they come to life in Rudolph The Red-Nosed Reindeer: The Musical. It’s an adventure that teaches us that what makes you different might just be what makes you special. Don’t miss this wonderful holiday tradition when it makes its highly anticipated return to Walton Arts Center! Dec. 2: Second Annual Cattywampus Co-Op Wampus Wonderland, Fayetteville Town Center. 10 a.m. to 6 p.m. All your favorite “Cool Kids” showcasing the amazing things that they create. Dec. 2: Share the Love Pet Adoption Event & Pet Photos with Santa, 11 a.m. to 2 p.m. Hosted by Animal League of Washington County, AR and Adventure Subaru Pet Adoption Event made possible by a grant from the #ASPCASharetheLove and in partnership with Adventure Subaru. Come find your new family member. Bring your pet for photos with Santa, and if you need vaccines or microchips, that will be offered, too. Dec. 3: Holiday Open House, Headquarters House. 2-4 p.m. 118 E. Dickson St. Come by and check out Headquarters House decorated for the holidays. There will be refreshments and entertainment as well as two book signings. Dec. 5: Pet Night with Santa at the NWA Mall. 6-8 p.m.
Dec. 7: Progressive Shopping Party. Several independent, locally owned Fayetteville businesses are hosting a Progressive Shopping Party the evening of December 7th. Park at one of the three stops and let limousines ferry you to each location and back to your car at the end of the evening. Each location will have light snacks and/or drinks as part of the celebration. The event is free and no registration is required. Dec. 9: Fine Art Market at Botanical Garden of the Ozarks. 10 a.m. to 7 p.m. 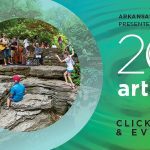 The Botanical Garden of the Ozarks will host a one day winter Fine Art Market featuring the work of over a dozen Art Ventures NWA artists. Purchase unique pieces for friends, loved ones or yourself. There will be a wide selection of styles and mediums, including paintings, sculpture and metal work. A portion of the proceeds of sales will benefit the Botanical Garden of the Ozarks and Art Ventures. Admission to the market and garden on this day is FREE – come shop the art market, BGO Gift Shop and then explore the garden! Dec. 9: Elf the movie, Jim and Joyce Faulkner Performing Arts Center. 3-5 p.m. Come dressed as your favorite holiday character and donate canned goods to the Gearhart Full Circle Food Pantry during the annual holiday film screening of Will Ferrell’s Elf. Although this event is free, it’s recommend that you should reserve tickets ahead of time. 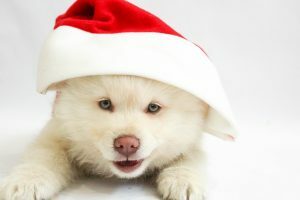 Dec. 12: Pet Night with Santa at the NWA Mall. 6-8 p.m.
Dec. 16: A Very SoNA Christmas, Walton Arts Center. 2 p.m. and 7:30 p.m. A collection of favorite sacred and secular music celebrating the magic and beauty of Christmas. Featuring the SoNA Singers, regional high school choirs, and special guest soloists. Dec. 17: The Snowman: A Family Concert presented by Walton Arts Center and Symphony of Northwest Arkansas. 2 p.m. Your favorite holiday treat returns to Walton Arts Center for a fourth year! 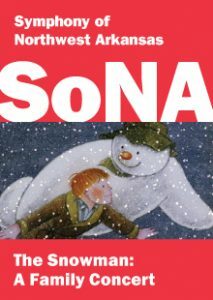 Experience a very special screening of the award-winning film “The Snowman” as SoNA musicians bring to life the extraordinary score in an afternoon that is sure to enchant your little ones. Dec. 21: “Kids Night on Broadway” event to see Finding Neverland at Walton Arts Center. Purchase an adult ticket and get a child’s ticket (ages 7-18) FREE! WAC will also have fun pre-show activities starting at noon, like make your own pirate hat and a treasure hunt! This special ticket event is happening at WAC on Thursday, Dec. 21st, for the matinee performance at 1:30 p.m. If you’ve always wanted your kids to see a Broadway show, this is the perfect opportunity. Dec. 21: Ozarks Wind Quintet holiday music concert. The Ozark Wind Quintet is performing a free concert on Thursday, Dec 21st from 6-7 pm at Stage Eighteen (just off the Fayetteville Square) as part of the Square celebrations. Free tickets available for in-person pickup at the Experience Fayetteville office on the Square. Doors open to ticket holders 5:45-5:55 and open to non-ticket holders at 5:55 p.m. At Stage Eighteen there’s table and bar stool seating, full bar and limited food. Dec. 2: City Christmas Parade and Tree Lighting, 6:30-9:30 p.m. The Farmington Kiwanis and Chamber of Commerce are working together to combine the annual Christmas Parade with the city’s Tree Lighting. The event will begin at Folsom Elementary School and end near the city library where there will be a large Christmas tree. There will be a parade, singing of carols, hot chocolate, cookies, and parents can take pictures of their kids with Santa. Dec. 2: Christmas Open House and Pictures with Santa, Old Cabin Events. 10 a.m. to 4 p.m. Pictures with Santa (children and fur babies), tours, food, and home made cookies. Dec. 16: Donuts with Santa. 9-11 a.m. Prairie Grove UMC. Stop by for donuts, pictures with Santa, and Christmas crafts. Event is free. You’re encouraged to bring a new pack of socks and/or underwear to benefit Prairie Grove Schools/Bright Futures if you’re able. 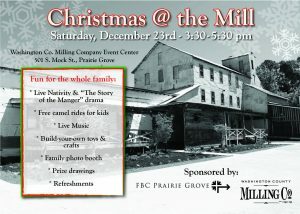 Dec. 23: Christmas at the Mill, 3:30-5:30 p.m. Washington County Milling Company Event Center. Fun for the whole family: live nativity & “The Story of the Manger” drama, free camel rides for kids, live music, build your own toys, family photo booth, prize drawings, refreshments. Free. Nov. 17-18: NWA Boutique Show, Holiday Inn Convention Center. We’ll be at the Boutique Show at our booth in the back, so be sure to stop by and say hello (plus sign up for our giveaway and nurse/feed/change your baby) in our private Nursing Lounge/Baby Changing Area! This juried show features boutique booths with custom and one-of-a-kind creations from local and regional designers. Clothing, jewelry, art, stationery, gifts, personalized items, home décor, furniture, baby essentials and more. Opens Nov. 24: Shipley Farms Christmas Trees. In addition to pre-cut Christmas tree and fresh wreath sales, Shipley Farms will have hay rides, music, hot chocolate and holiday lights. They will also “flock” your tree or wreath (apply fake snow). 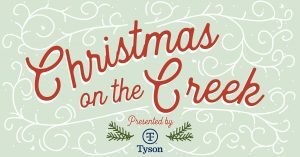 Nov. 25: Christmas on the Creek, downtown Springdale. At 5:30 p.m. in Shiloh Square, the Springdale mayor will hit the switch on the region’s largest live Christmas tree display. The whole events runs from noon to 7 p.m. This event will take place just off of Spring Creek in downtown Springdale and Walter Turnbow Park. Complete with a Christmas parade, lighting of the region’s largest live Christmas tree, live music, photos with Santa, carolers, food trucks, handmade winter market, holiday displays in businesses, a celebration of Small Business Saturday, and more. Nov. 25: Christmas Parade of the Ozarks. 6-8 p.m. The parade theme is Christmas Around the World. The parade will begin at the Parsons Stadium rodeo grounds and continue west on Emma Avenue. Dec. 2: Children’s Christmas Train ride and holiday fun. Children’s Christmas Train riders will depart from the Emma Street Train Depot in Downtown Springdale on Saturday, December 2nd aboard a restored 1940’s era train. The 40 minute ride to Johnson and back will include singing Christmas carols, stories, and even a visit from Santa himself. After returning to the Train Depot families can enjoy holiday games and entertainment – ride ponies dressed as reindeer, operate a model train, participate in the cake walk, write a letter to Santa or just enjoy the characters and live music in Santa’s Village. Children and families are also encouraged to dress in holiday attire. Children 2 years of age and under do not require a ticket but will have to sit on your lap, $10 for ages 3-12, and $20 for adults. This event will sell out. The Children’s Christmas Train is a fundraiser for the Children’s Safety Center of Washington County which provides services for abused children. 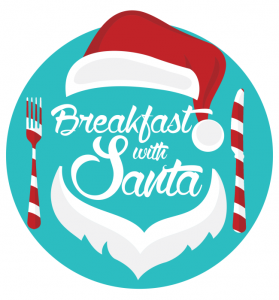 Dec. 2: Breakfast with Santa, Arts Center of the Ozarks. A morning of food, fun and photos with Santa, Mrs. Claus and the Elves. Ticketed sessions at 8:30 a.m., 9:15 a.m. and 10 a.m. Adults and kids alike will enjoy a hearty breakfast of omelets, sausage biscuits, cereal, donuts, pastries and beverages. Kids will be busy in Santa’s workshop decorating gingerbread cookies, making reindeer food and creating Christmas ornaments. Each child will get their picture taken with Santa and parents can download and print as many copies as they please. Mrs. Claus and the Elves will want their pictures taken too, as will Ronald MacDonald as he spreads Christmas cheer throughout the morning. Adults and children are invited to enjoy this magical Christmas experience in ticketed sessions at 8:30am, 9:15am and 10:00am. Tickets are $15/child and $10/adult, available at www.acozarks.org. Dec. 5: Ugly Sweater Pub Crawl + Gourmet Popcorn Bar, downtown Springdale, 6-7 p.m. Put on your fuzziest, funniest, and ugliest Christmas sweaters and head to downtown Springdale pub crawl. Enjoy an impressive complimentary popcorn bar while everyone votes for the ugliest sweater at 6:45pm. Meet at 101 E. Emma Avenue at the Springdale Fantasy Tree Farm from 6-7pm to enter the ugly sweater competition. One ugly winner will win a complimentary drink from each downtown Springdale pub to include The Odd Soul, Black Apple Crossing, Emma Ave. Bar & Tap, and Core Public House – Emma Ave.
Dec. 9: Santa’s Big Trip, The Jones Center. 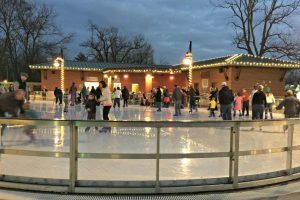 Ozark Figure Skating Club will host its annual Christmas show on Dec. 9, with shows at 1 p.m. and 5 p.m. This year’s show is titled Santa’s Big Trip. Tickets will be sold at the door. Tickets for bleacher seating are $8 for adults and $5 for children ages 8 and under. On-ice VIP seating is a new option this year. VIP tickets are $12 each regardless of age. The show lasts about an hour, and there will be concessions available. After each show, the audience is invited to come downstairs to skate with Santa and the cast for about an hour. Skating with Santa and the cast and skate rentals are free with admission to the show. Dec. 15: Caroling on the Creek, downtown Springdale. Walter Turnbow park will come alive with the sounds of the season as over 20 Choirs perform. All levels of choirs are represented. Music begins at 5 p.m. and Santa arrives at 6:30 p.m. The stage will be set up on the East side of Walter Turnbow Park singing towards the west over Spring Creek. At Shiloh Square you’ll find over 20 PTSO booths (Parent Teacher Student Organization) promoting and showcasing involvement in the school and community. There will also be booths showcasing a variety of programs from across the Springdale schools. Nov. 24: Dye Family Christmas-Cloverdale Lights. Located at 10537 Oak Tree Circle in Rogers, this family light show is sequenced to music and uses new technology lighting. Dec. 1: Rogers Christmas Parade: A Hollywood Christmas. The parade will start at 7 p.m. in downtown Rogers, 201 S. 1st St. 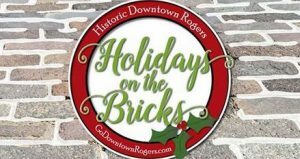 The streets in Downtown Rogers will be decked with Christmas cheer for its annual Christmas Parade to welcome Santa. The sidewalks line up to enjoy beautiful floats passing through downtown. Santa makes his appearance at the end of the parade. Dec. 2: Jingles Holiday Spectacular. Rogers Public Library, noon to 1 p.m. Come meet Jingles the Elf at this family-friendly holiday show. All ages are welcome. Children under the age of 7 years must be accompanied by an adult at all times. Dec. 2: 2nd Annual Holidays on the Bricks events. Dec. 8-10 & 14-17: A Christmas Story play, Arkansas Public Theatre. A Christmas Story follows 9-year-old Ralphie Parker in his quest to get a genuine Red Ryder BB gun under the tree for Christmas. Ralphie pleads his case before his mother, his teacher and even Santa Claus himself, at Higbee’s Department Store. The consistent response: “You’ll shoot your eye out!” All the elements from the beloved motion picture are here. Dec. 9: Celebrate Christmas Card Day, Rogers Public Library. Noon to 2 p.m. It’s National Christmas Card Day! Join the Children’s Library to celebrate and create holiday greeting for someone special. We’ll have plenty of craft materials; you’ll just need to bring your imagination. Dec. 9: Breakfast with Santa, First Christian Church, Rogers. Fundraiser for Micah’s House with food, crafts & activities for all ages. After breakfast, you’ll be guided to arts and crafts stations where kids can make gifts to take home. Sit down to write your family’s own letter to Santa, and then you’ll be ushered into your personal meet-and-greet with the big guy himself. Tell Santa what you’re wishing for, deliver your letter, and pose for a family photo before you pick up your very own swag bag filled with goodies and gifts the whole family can enjoy. All ages are welcome to join the festive fun, and families are encouraged, with children 2 and under free of charge. Tickets are $15 per person, and are available for timed breakfast seatings at 8 a.m., 8:30 a.m., 9 a.m., 9:30 a.m., 10 a.m., 10:30 a.m., 11 a.m. and 11:30 a.m. To purchase tickets, visit www.MicahsHouseNWA.org, contact the organization at micahshousenwa@gmail.com or call 479-282-0928. Dec. 9: Santa on the Caboose. Frisco Park, corner of Walnut and 1st St. Come visit Santa on the caboose from 10 am. to 2 p.m.
Dec. 16: All Wrapped Up. Santa, face painting, kids table, shopping with over 45 vendors and gift wrapping. Benefits the D.E.B. Project, a non profit organization that helps kids who are less fortunate. We will be doing a toy drive (bring a unwrapped toy please). Dec. 22: It’s a Wonderful Life movie, Arkansas Public Theatre. 7-10 p.m Dress up for cocktails and a viewing of the greatest Christmas movie ever made, “It’s A Wonderful Life”. At the beautiful Victory Theater in Historic Downtown Rogers. Kid friendly. 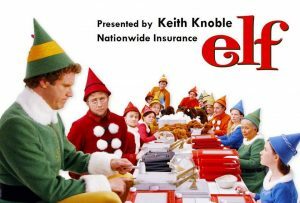 Dec. 23: Elf movie, Arkansas Public Theatre. Spend a fun afternoon with your family watching “Elf” while enjoying donuts & hot cocoa. Wear your pajamas, take home treats and start a new family tradition. Doors open at 12:30 pm Movie starts at 1 pm Seating is limited. Tickets are $5 per person. Dec. 16: Winter Wonderland Princess Ball, John Q. Hammons Center. 4-6 p.m. Over 10 princesses and characters will hosting the ball, which will include crafts, mini manicures, face painting, light makeup application, and sweet treats. Brock entertainment will be there running the dance floor encouraging all the children and princesses to bust a move! There will be performances and sing alongs by all the princesses throughout the evening. General admission is $50 per ticket and includes one free adult admission. Additional adult admission can be purchased for $7.50 and siblings under the age of 1 are free. Nov. 18: Lighting of the Square. 4-6 p.m. Annual Lighting of Square event. Grab a warm drink, enjoy live bands at 4 p.m. and at 6 p.m. the mayor will turn on the lights. Nov. 18: Ice Rink opens at Lawrence Plaza. Before the annual lighting of the square event, enjoy ice skating at Lawrence Plaza. The rink opens at noon. The season runs Nov. 18-Jan. 15. Starts Nov. 25: Conover Christmas Lights. 3700 SW Plateau Blvd. Conover Christmas is all about the lights. Every year this homeowner puts on a light show synced to music. Tune in your radio and watch the magic happen (there will be a sign at the house to let you know which station). This year the family is accepting donations for the new NWA Children’s Hospital. Dec 1: The Grinch: Reading, Movie and Good Deed Journal. 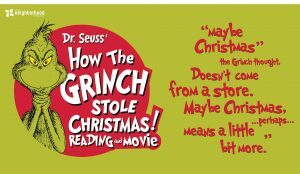 6-8 p.m. Stop by The Neighborhood Church on SW Regional Airport Boulevard for an interactive reading from The Grinch himself. Also watch the movie with your family. They will also be handing out The Grinch version of an Advent Calendar: 25 days of Good Deeds to Grow your heart three sizes just like The Grinch. Dec. 1-2: Live Nativity & Noel, 1101 McCollum Road, Bentonville. Nativity & Noel is the perfect Christmas community event focusing on the birth of the Savior. Live Nativity re-enactment and an extraordinary display of international creche exhibits. Dec. 2-3: The Nutcracker presented by The Conservatory, Arend Arts Center. 7-10 p.m. on Saturday, Dec. 2, and 2-5 p.m. on Sunday, Dec. 3. The Northwest Arkansas Conservatory of Classical Ballet presents the fifth annual production of Tchaikovsky’s The Nutcracker. This full length production features professional guest artists from NWA Ballet Theatre with Ryan Jolicouer-Nye. 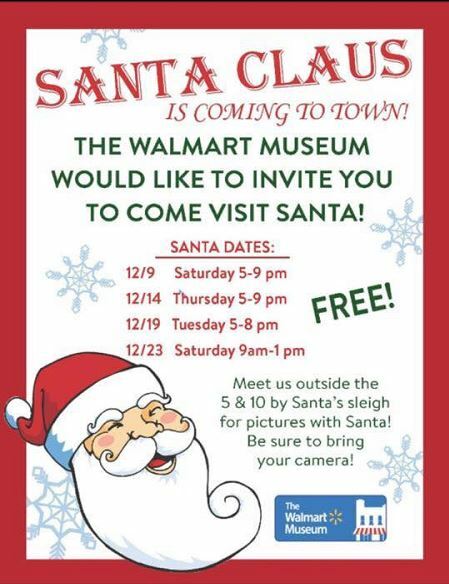 Dec. 9, 14, 19 and 23: Santa at the Walmart Museum. See times below. Bring your camera and meet by Santa’s sleigh outside the 5&10 for pictures with St. Nick. Dec. 9: Bentonville Winter Wonderland Christmas Parade. 10 a.m. to noon. The annual Christmas Parade is coming — a wonderful tradition to share with family & friends. The parade will start at the Fire Station, make it’s way up Main Street and end at the Square. Music on the square. Dec. 16: North Pole Express. 5:30-9 p.m. Sponsored by the Bentonville Breakfast Lions Club, this is a family Christmas adventure for children of all ages at the Nightmares Haunted House location on Frontage Road. NOT scary. Free event includes pictures with Santa and a train ride. Dec. 16: The Little Craft Show Bentonville, 104 SW A St. Noon to 6 p.m. 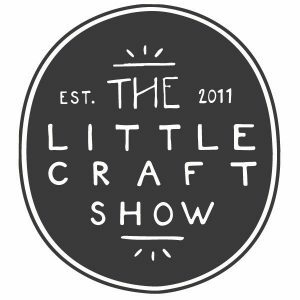 This year, The Little Craft Show is partnering with Downtown Bentonville, Inc. to host a Bentonville edition of the winter show. Expect to find beautiful handmade goods, unique art and gifts, and local food and drink. Dec. 16: Christmas Open House, Peel Mansion. 10 a.m. to 3 p.m. Come visit the Peel mansion all dressed up for Christmas. This year’s theme is the Twelve Days of Christmas so you can expect a Twelve Day different theme in each of the rooms as you tour the house. Share the spirit of Christmas with some music, hot cocoa, cookies and a visit from Santa. This is a free and family-friendly event. Dec. 17: Comedy Improv Matinee (family friendly). 2-3:30 p.m. Meteor Guitar Gallery. Laugh away some holiday stress by bringing the whole family out for Sock Monkey Improv’s Christmas show. Sunday matinee. Tickets are $10 adult and $5 under 18 years. Dec. 23 Museum of Native American History story time. 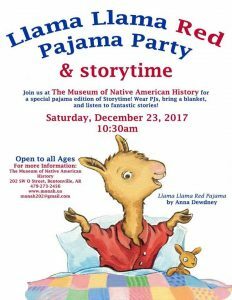 10:30-11 a.m. Bring your PJs and blanket to a special Holiday Storytime at the Museum of Native American History. Mrs. Mel will be reading some fantastic stories like “Llama Llama Red Pajama” by Anna Dewdney. Storytime is geared to kids ages 4 and up; kids of all ages and their adults are welcome. Free and Open to the Public. Dec. 9: Christmas Festival. 10 a.m. to 7 p.m. The public is invited to the Centerton Christmas Festival on December 9th at the city park located at 290 North Main Street. This is an all-day event which will include a Craft Fair, Christmas Parade, and Christmas in the park. Dec. 8: Breakfast with Santa. Centerton City Hall. 8-10 a.m. Before the Christmas Festival starts, come have breakfast with Santa. $5 per person, children 5 and under are free. 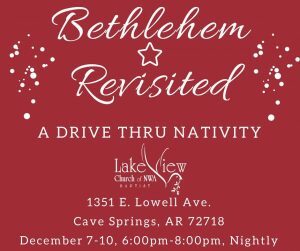 Dec. 7-10: Bethlehem Revisited, A Drive-Thru Nativity, 6-8 p.m. each night. This will be 6 scene display of all then events leading up to the Birth of Christ! There will be live animals, CD narration in your vehicle, and a cast of 100+ people from Lakeview Baptist Church. Come see this FREE event for all ages as we tell the gospel story that begins with the Birth of Christ. Starts Nov. 23: The Great Passion Play Lights Drive-Through. Enjoy a forest of 200 Christmas trees on the way to see the Christ of the Ozarks statue. Starts the last weekend of November through January 1 It’s a by-donation drive-through light display with lights on from dark through 8 p.m. on Thursdays through Sundays. During the day, you can experience the Holy Land, museums, and backstage tour. Advanced reservations required for those events. Dec. 1: Christmas Parade of Lights. 6-7 p.m. Downtown Eureka Springs. One of Eureka’s favorite parades. The Parade of Lights rolls at 6 p.m. through the beautifully decorated downtown streets with floats, walkers, bands and thousands of lights. Dec. 2 & 9: Santa in the Park. 1-3 p.m., Basin SpringPark. Give your Christmas List to Santa and grab a photo op! MomandPop will be singing Christmas tunes to delight all ages while kiddos get the chance to make an ornament and play a few rounds of the Christmas Cane Walk. This hometown Christmas fun is brought to you by the Main Street Eureka Springs team to make shopping in Eureka Springs a little more cheerful. 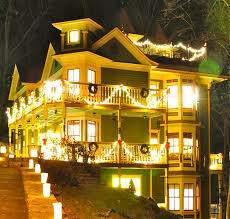 Dec. 2: 35th Annual Candlelight Tour of Homes. A walking tour of a sampling of Eureka’s most beautifully restored homes giving guests a glimpse of a bygone era. All stops on the self-guided tour will be lavishly decorated for the season with Victorian attired docents to relate the history of each home.Visitors will be treated to carolers, Christmas music and refreshments along their journey into the past. Dec. 9: Night of a 1000 Santas. 5-11 p.m. Event is for ages 21 and older. The Premier Downtown Eureka Springs Santa Scavenger Hunt is back Join hundreds of Santas and his helpers to find spots with games, clues, and trivia throughout the night in Downtown Eureka Springs. The person who gets the most points will win a trip back to Eureka Springs. (Ties are broken by a randomized drawing. All prizes are final.) Must have an iPhone or Android device to participate – more details to come. Tickets available soon and will be on site at the Night Market on Spring Street (the starting point) on the night of the event. Benefits the Main Street Eureka Springs program to bring more great programming to Downtown Eureka Springs. Bring a Santa hat or full Santa gear to participate. 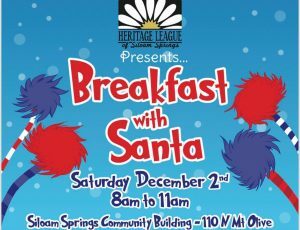 Dec. 2: Breakfast with Santa, Siloam Springs Community Center. 8-11 a.m. Get your picture taken with Santa, enjoy crafts, a light breakfast, and tons of fun. Write a letter or color a picture to send to Santa as well. *Tickets must be pre-purchased. Get yours from a Heritage League member or at a few local businesses. Dec. 2: Red, White and Who Christmas Parade and downtown lighting. 5:30-8:30 p.m. Opens Nov. 18: Wonderland Christmas Tree Farm. This is a choose-and-cut Christmas tree farm in Pea Ridge. They also have pre-cut trees available for purchase. This real working tree farm offers a hay ride out to the fields and a family atmosphere. 14821 Miser Road, Pea Ridge. 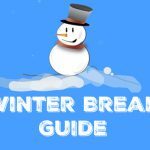 CLICK HERE to see a printer-friendly version of the Holiday Events Guide! 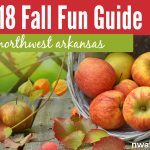 2018 Fall Fun Guide: Top 10 things to do with your family this fall in Northwest Arkansas!